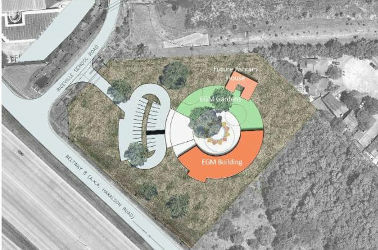 Over the past few months RdlR architects team led by the Lorie Westrick have worked diligently to incorporate all our inputs and suggestions to create the best possible design for the Eternal Gandhi Museum. Thanks to their tireless efforts and creativity the above design has evolved. The floor plan is a simple one yet elegant! Visitors will be arriving to an open welcome lobby. They will enter the museum through a vestibule, a LEED requirement, into the lobby. Behind the lobby is the multipurpose room where the visitors will be shown an introductory film about the museum. There will be two additional display areas on each side of the multipurpose room. 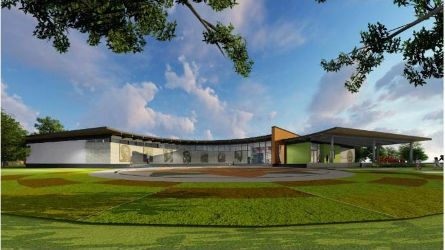 The visitors will then proceed to the main museum area where the Eternal Gandhi Exhibits will be displayed. EGM is planned as a cost effective structure to be elegant in its simplicity like Gandhiji himself. EGM is envisioned as a jewel among the woods. The 3 acre site will retain a natural appearance. 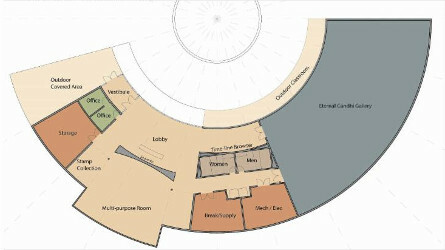 EGM architecture and gardens together form a complete circle to represent the ethernal truth found in Gandhi’s teachings.